As he prepares to retire and looks to his next adventure, a Georgia cabinet installer finds an opportunity in bees. All farmers, even. In agriculture, you coax what you can from the natural world, but know that you can’t control the weather. Such are the lessons Ellis has learned in his fifties, as he prepares for an unusual retirement career: bees. Almost two decades later, after careers in sand and gravel production, then working at a hardware store, Ellis finally cashed in on Mindy’s promise. In 2005, on a whim, he became a short-term apprentice to a kitchen cabinet installer in Georgia. As he drove back to New York after the month was up, he realized he’d found a new calling. In 2005, he moved south with Mindy and their youngest son, and eventually struck out on his own. He quickly realized bees were a good way to make money—and also a fascinating little world. Bees have an intricate social system, dependent on different roles and rituals. When a colony is ready for a new queen, for example, the worker bees deliver royal jelly, a special secretion, to the selected larvae housed inside a special cell. A little more than two weeks later, a queen will emerge, prompted by the chemical properties of the jelly. The business side intrigued Ellis, too. Some bee operations specialize in selling queens, others in “nucs,” or nuclear colonies, which have been split off from a larger colony to establish a new hive. Some people simply build beekeeping equipment. Others market their hives’ honey or ship truckloads of bees across the country to pollinate almond farms. Ellis started with a dozen hives on his back deck in Gainesville, an hour outside Atlanta. He owned just a quarter-acre, but the bees thrived. As he became more committed, Ellis realized he needed more space. Last year, he and Mindy bought a 4.6-acre property in the small town of Maysville, Georgia, where he now has 50 hives. The business has delicious benefits. In a closet in his foyer, for example, Ellis stores a fermenter that is brewing honey wine. There are jars of honey stowed on his kitchen counters, some in familiar amber, others filled with thick creamed honey, processed to control crystallization. “But the honey is just icing on the cake,” Ellis says. His real aim is to serve other beekeepers; out of a smoker he bought at a hardware store, he is building a brooder to develop queens, and he plans to sell nucs as well. When Jim Ellis first visited agricultural equipment dealers, he couldn’t get the time of day. Perhaps that’s because he’s an unusual sort of farmer: He raises not corn nor cattle, but bees. 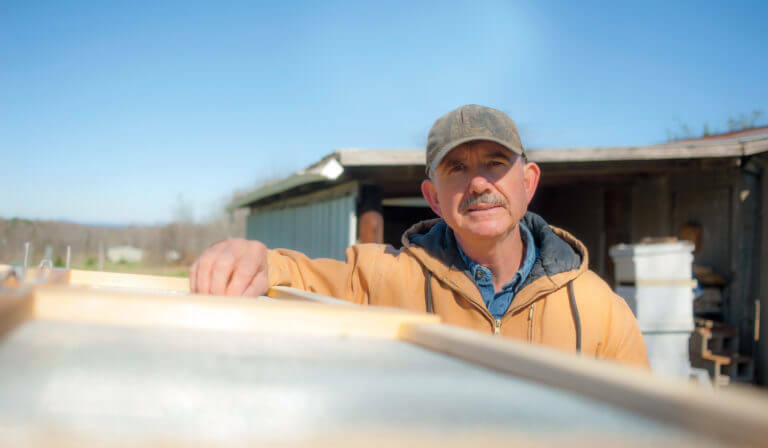 “I don’t think they thought [my business] was going to go anywhere,” says Ellis, who is in the process of building up his beekeeping business as a full-time, post-retirement career. But, finally, Ellis visited Cain Equipment in Clermont, Georgia. “I could see at once that [owner] Kabe Cain had been in this his whole life,” Ellis says. “He knows how to relate to the customer,” even when, like Ellis, it’s a rare type of customer with special considerations. Many beekeepers use a skid steer to move their hives, but Ellis also plans to plant a few acres of cash crops on his property. It didn’t make sense to invest so much in a tool with only one job. When he revved up a Massey Ferguson 1734E, with its easy-to-use open-air operator platform, “it just felt right,” Ellis says. He liked that its compact size—which saves room on his trailer for his bee boxes—still comes with real power. The hydraulics, with a total flow of 10.5 gpm, are perfect for moving as many as 48 bee boxes at a time, and the 34-HP engine means he can put the tractor to work on his crops. That flexibility is exactly why Cain guided Ellis to the 1700E (Economy) Series. The 13 compact tractor options in the Massey Ferguson 1700 Series—which also includes the GC1700 Series and the 1700 (Premium) Series—do the work of much bigger machines, while the many available implements make the series perfect for a farmer that has multiple needs. “The quick change of the bucket to the forklift is so simple and easy,” Ellis says, making shifting from beekeeping to gardening a breeze. Moving bee boxes is a delicate process, Ellis says, but the 3-range mechanical transmission ensures he has full control. And the 4WD has made moving the tractor on and off his trailer simple, no matter the conditions.